A former pupil of King Edward’s School and his teacher have jointly received the Exceptional Pupil Achievement Award at the Design and Technology (D&T) Association Excellence Awards 2019. 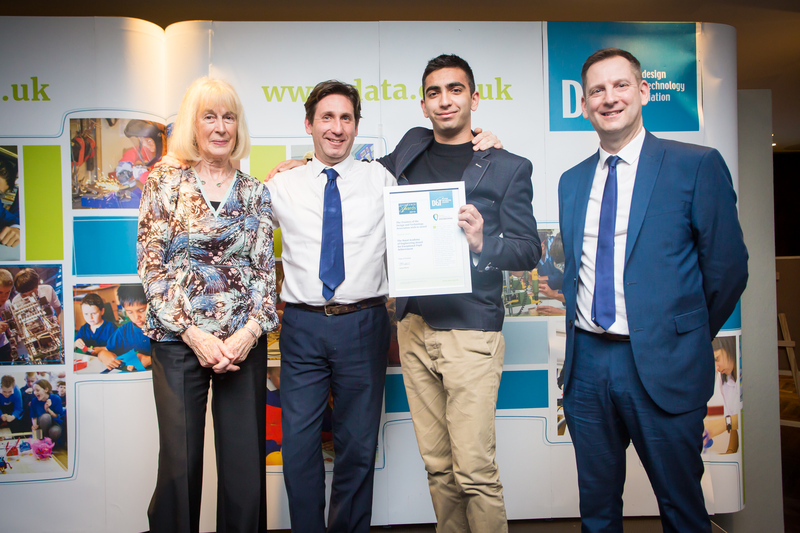 Shonak Joshi, who completed his studies at King Edward’s in 2018, and Head of Design and Technology Phil Balkham were presented with the award at the D&T Association’s annual award ceremony at The Institution of Engineering and Technology in London on Friday, 22 March 2019. The award, which is sponsored by the Royal Academy for Engineering, recognises the achievement of both an individual pupil and their teacher, and is nominated and voted for by peers in the education sector. The nomination was made after the project Shonak entered into the Triumph Design Awards 2018, impressed the judges and won the competition’s top prize. He received the winner’s trophy, £500 and two weeks of paid work experience in Triumph’s design department for his project, The Smart Protect, a single smart device designed to protect the vulnerable and elderly by alerting relatives, via their smartphones, when it detects harmful gases, smoke, or motion caused by potential break-ins. Phil Balkham, Head of Design and Technology at King Edward’s, said: “I am delighted that Shonak’s work has been recognised with this prestigious award. This is the fourth major award that Shonak has received in the last year, which really does highlight his talent as a designer and engineer.